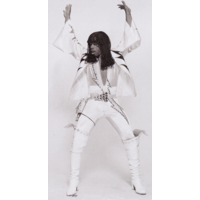 James Ambrose Johnson(February 1, 1948 – August 6, 2004), better known by his stage name Rick James, was an American singer, songwriter, musician and record producer. James was a popular performer in the late 1970s and 1980s, scoring four #1 hits on the U.S. R&B charts performing in the genres of funk and R&B. Among his well known songs are "Super Freak" and "You and I". In addition to his music, James gained notoriety for his wild lifestyle, which led to widely publicized legal problems, and which was famously spoofed by Chappelle's Show in 2004.